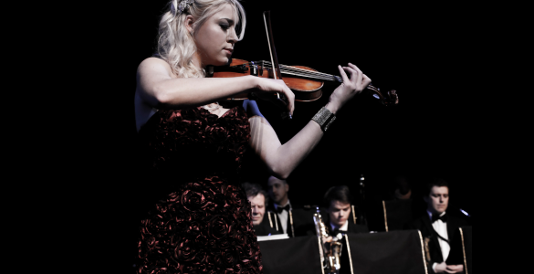 Elevate Your On Board Entertainment - With One Violinist. Kate Violin has a unique way of captivating any audience. Her hands can entrance with a classical gem, or make their feet move to a modern masterpiece. Kate can blend her breadth of musical knowhow to create the perfect tone to entertain—whatever your age, mood, or musical taste. She can play waves of soothing solos to help everyone unwind, or perform accompanied by a band or an orchestra with electric notes to make the crowd come alive. Kate is a classically trained artist with a gift and a passion for her craft. 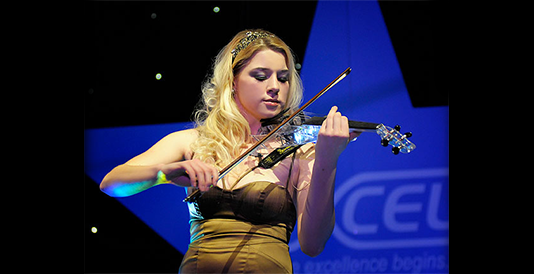 Her main inspiration is Vanessa Mae, but Kate has developed a fusion of classical and contemporary styles which is truly her own. Witness the way she sways in sync with her custom-made, clear, Ted Brewer Vivo 2 electric instrument. The spectrum of sounds she creates, it just seems so natural. Nonetheless, she.s worked incredibly hard to become such an astounding entertainer, earning a Master.s Degree in solo violin performance (with distinction). Of course, she.s also had great teachers—world renowned, in fact—which is what Kate is well on her way to becoming. 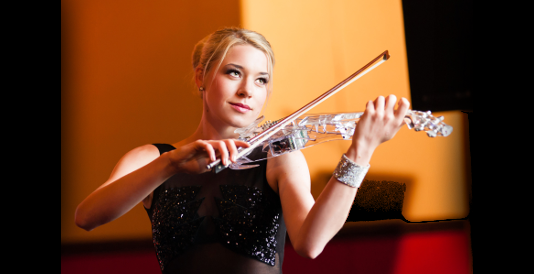 It all started when Kate was only six years old and picked up her first violin. This child- prodigy moment sparked an interest that would see Kate dedicating her life to perfecting her musical artistry. Subsequent to her scholastic achievements, Kate has enjoyed recording two studio albums. The Violinist (2009) which sold over 4,000 copies worldwide and My Classical Interpretations (2012) which features tracks that have been broadcast on the BBC and used for programmes on ITV. Kate has also performed live on TV (BBC 1, SKY and Arabic Al Sharqyia) and radio (NE1 FM Newcastle and BBC Radio Humberside). Another success for Kate has been the ever-increasing popularity of her website and YouTube channel. Millions have logged on to buy her exclusive singles, and to delight in her diverse interpretations of classical gems and modern hits—from Vivaldi to the Beatles. A number of prestigious corporate clients have applauded Kate.s performances. To name a few: Land Rover, Vogue, IBM, Apple, House of Fraser, Harvey Nichols, Heineken and Debenhams. Kate has played for an International Forex Event for Ducascopy Bank in Geneva; Bisquit Castle Inauguration in Cognac, France; and Atlantica Imperial Resort, Rhodes, Greece. She has also performed at several venues in the US and Asia. Note-worthy UK shows have included: The European Watch of the Year Awards at May Fair Hotel, London; West Yorkshire Police Awards Ceremony at Royal Armouries, Leeds; Confederation of British Industry (including Gordon.s Group) Parkinson Building, Leeds; Electric Night of the Proms, Northern Design Awards Ceremony in Central Manchester, Manchester.